Ever wanted to see the trajectory of your shot patterns? 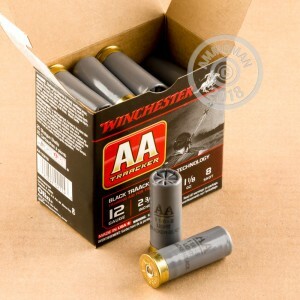 Now you can with Winchester AA TrAAcker shotshells. Available in a variety of gauges and shot types, these shells contain a special wad with long petals and high-visibility colors (in this case, black for clear skies). The wad is designed to stay in the center of the pattern, providing better feedback to the shooter. This particular 12 gauge load fires a 1-1/8 oz. 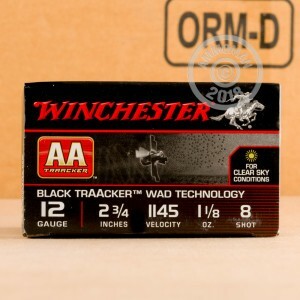 pattern of #8 shot at 1,145 feet per second and is ideal for a variety of target shooting purposes. Each box contains 25 shells. Like other Winchester ammunition, these 2-3/4" shells are made in the USA.